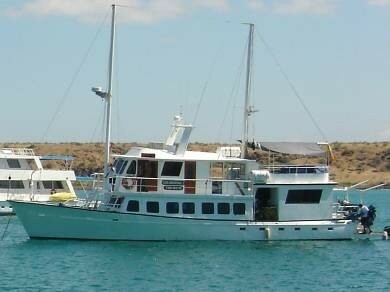 The Guantanamera is the ideal boat for the young traveler looking for a small and nice motor boat to visit the Galapagos Islands. 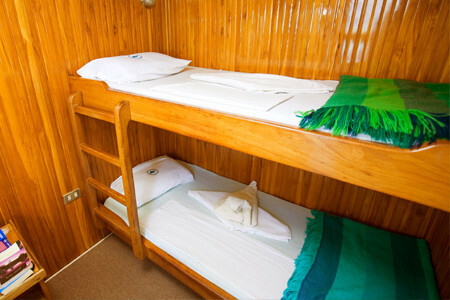 This yacht features 5 double cabins with one bunk in the upper-deck, and 3 double cabins in the lower-deck, 2 of which are matrimonial. This boat’s itinerary includes Genovese Island, famous between the ornithologists, birdwatchers and photographers for the red-footed booby, among other unique species that can only be found in this far-North Island. 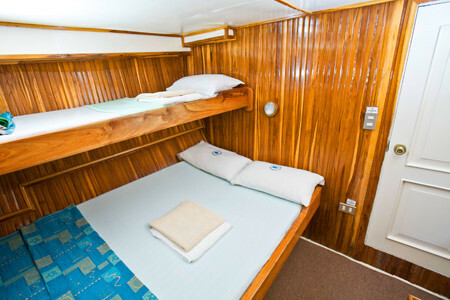 The Yacht is a spacious and comfortable owner-operated motor yacht that accommodates 16 passengers in cozy double cabins, all decorated and equipped to provide guests a relaxing cruise in the Galapagos Islands. Golondrina welcomes you on board and invites you to discover the pristine habitat of the unique animals and primeval flora and fauna of the Galapagos Archipelago. 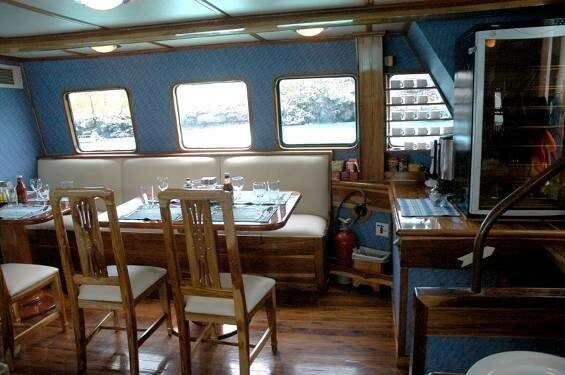 The Galapagos M/S Encantada sailboat is one of the most picturesque yachts that cruises in the archipelago. She has been affectionately dubbed "The little red sailboat" due to her candy apple red color and gracious white sails. 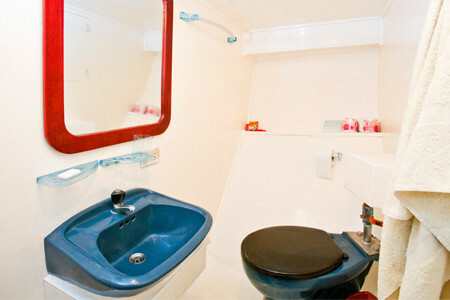 Facilities include private bathrooms in each cabin. Public areas offer generous deck space, dining room and bar. Cruising at 7 knots with a 5-person crew, including a naturalist guide, Encantada is also an ideal boat for private charters and scuba diving groups. The M/S Encantada, an exotic, romantic motor sailor is outfitted to carry 12 passengers in 6 double cabins on a once-in-a-lifetime cruise to the Galápagos. 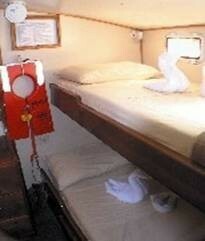 The M/S Encantada offers the most flexible itineraries for cruising the Galapagos Islands. Our well planned itineraries allow passengers to combine Island visits with occasional dive immersions at specific dive sites. Divers and non-divers can travel together, in the past divers would have to travel separate from their families in order to enjoy the archipelago´s marine life. 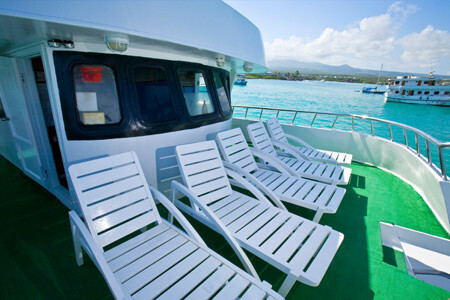 Now the M/S Encantada has put together a dive-tour combo so they can bring the family along and enjoy scuba activities while everyone else visits the Islands or snorkels nearby. A unique combination of breathtaking landscapes, wildlife encounters and hotspots for snorkeling and Galapagos world class diving. 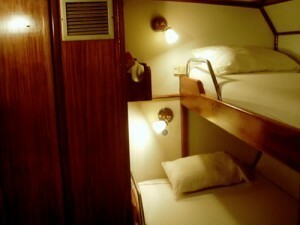 We leave port on Sundays and Wednesdays offering 3, 4 and 7 night cruises all year round, except for maintenance dates. 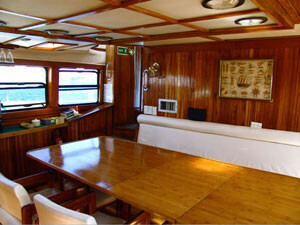 The Darwin yacht is constructed by a native from the Galapagos and is build from wood. 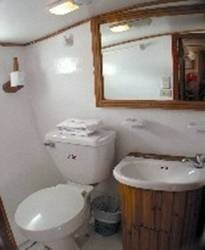 It has 8 double cabins all equipped with private bathrooms and hot water. 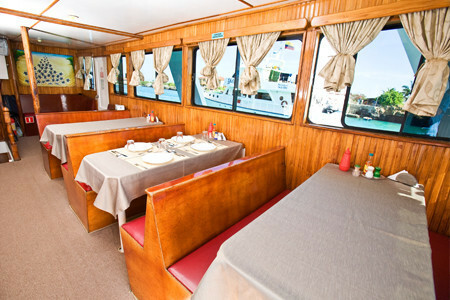 There is a diningroom and between the excursions you can enjoy the beautiful views of the Galapagos islands from the sundeck.